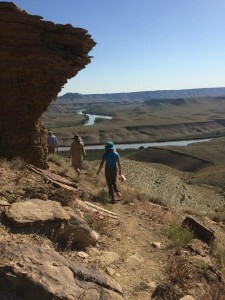 I have found myself in love with multi-day rafting trips and my latest excursion took myself and a friend to the Green River in Desolation Canyon out of Utah. To begin this trip, we were to fly to a place then begin a hike down to the launch point on the river. The plane ride was extraordinary, a very special part of this vacation. Redtail Aviation does a great job! As the morning airlifted us above the mountains and bluffs that surround Desolation and Gray Canyons, we could see for miles. It was really awesome! We saw wild horses running on the bluffs. After landing and meeting our guides, Taylor, Cade, Steve and Drew, we began the trek down the steep terrain that would take us to Sandwash where our rafts were waiting. The hike was beautiful, exhilarating, scary, slippery and slow. The first day was a float as we introduced ourselves to the canyon. Spending the first night at Stampede Flats where just a week before, this campground was under water. 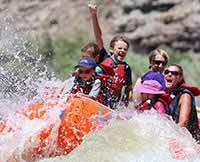 Each day continued to get more exciting as we had more rapids. I enjoyed spending time running rapids like Wild Horse, Lower Wild Horse and Steer Ridge in the double duckie. That night was spent at Steer Ridge on a big campsite, very nice. Day after day something new, from a bear sighting, beaver’s swimming across the river, lots of bighorn sheep, deer, many Blue Herons and even a Golden Eagle. We saw McPherson Ranch and a hike to see Indian Petroglyphs. The last night on the river was spent at Nefertiti camp and the whole group had so much fun swimming the rapids and even swimming on life jacket woman (you had to be there)! As any river trip will do, you come to the beginning as a group of strangers and throughout each day and each new adventure, you get closer to those people. We all shared some very fond memories.